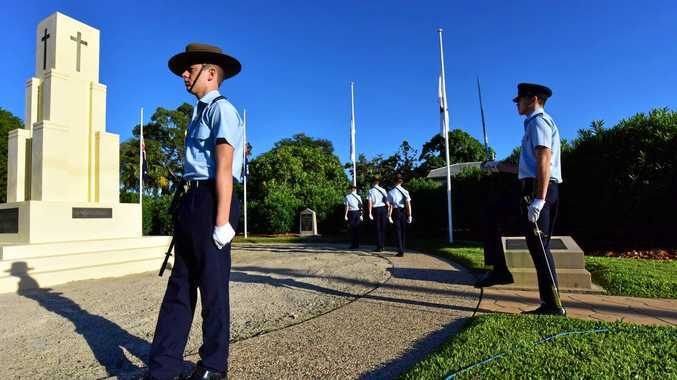 SCHOOL drop-offs can often look like a Toyota dealer's forecourt, given the vast number of Kluger seven-seat SUVs lining up outside the gates. Toyota keeps its family favourite simple. Three grades, 2WD or AWD and 3.5-litre V6 and auto gearbox only - no diesel, no manual, take it or leave it. Our family of four hops aboard the entry-level GX AWD to see how this jumbo stalwart handles the daily grind. IAIN: These Klugers are mighty things but they look sleek and modern. JULES: Imposing more like. That grille looks like an aggressive Mack truck's. IAIN: It's built in the US and the Yanks like their SUVs loud and proud. 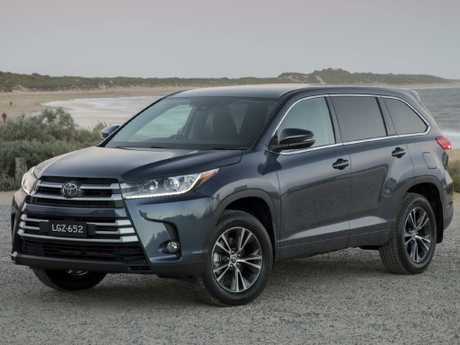 You can't fault Kluger's Aussie sales though; we consistently buy more than 1000 a month. I know plenty of parents who are in the Kluger clan. IAIN: Most large SUVs make use of four-cylinder turbo diesels but the Kluger's an old-school V6 petrol-only kinds guy. Toyota does a cracking four-cylinder diesel in its Prado and HiLux. JULES: Our GX AWD costs $47,990 drive-away. That's a lot for entry-level. What are its rivals? IAIN: Seven-seater petrols include the Hyundai Santa Fe, Kia Sorento, Mazda CX-9, Nissan Pathfinder and Skoda Kodiaq. 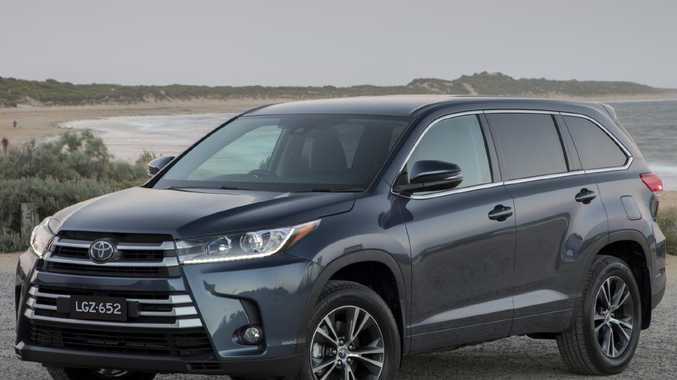 Most of those can be had with a less thirsty diesel and typically more features for the Kluger's price. JULES: May I politely say it feels typically Toyota inside? IAIN: By that do you mean well built, unfussy, practical but lacking any razzle-dazzle? JULES: Nailed it. It's all user-friendly but if Toyota has a maverick design genius brimming with panache, he was off sick on Kluger cabin design week. IAIN: This is the entry-level, remember, and that means cloth seats, no keyless start and a 6.1-inch screen. There is an eight-incher in higher grades, which are a whopping $10K (GXL) or $20K (Grande) more than ours. JULES: Cloth seats they may be but they're sink-in comfy. The screen looks tiny. Plus it's so far away I have to lean out of my seat to use it. IAIN: How good's the storage though? There's a smart shelf running the width of the lower dashboard, which is ideal to sling in phones, tablets, papers and snacks. JULES: Giant cup holders and the centre console storage is a monster. Fill that with water and you'd have a hot tub in your car. IAIN: The driving position is so elevated I'm up there with the truck drivers. JULES: Great vision and it's a lovely cruiser too. On motorways it purrs along with barely any engine noise and absorbs bumps effortlessly. IAIN: Radar cruise control makes highways a pleasure. The lack of in-built satnav or Apple CarPlay/Android Auto makes the infotainment, especially with that tiddly screen, seem very last generation. JULES: The boot's a whopper. The two rear seats are easy to fold up or down with the pull of a handle, leaving massive load space. IAIN: This bottom grade misses out on an auto tailgate though, something these big SUVs really benefit from. JULES: For such a big car, it's easy to park and manoeuvre. The steering is so light. Rear park sensors are great but that small screen means it's hard to use the reverse camera clearly. IAIN: It has a foot rather than hand brake too. That's something that should have died with 1980s SUVs. JULES: Safety is excellent. Airbags for all rows of seats and lane departure warning are good but I'd like a blind spot monitor. IAIN: You're so high up surely you can see everything coming? JULES: I can climb into the second row to do up the kids' car seat harnesses, there's so much space here. IAIN: Plus the middle row slides forward to give more space to the third row - those seats are just tolerable for adults but ideal for kids. JULES: Air vents for each row, cup holders everywhere and loads of space for kids' bikes and sport gear. It's hugely family friendly. IAIN: I trust Toyota's reliability but only a three-year/100,000km warranty is poor. That's equalled or trumped by every rival. JULES: Put me on a highway and I'd cruise for hours. Just avoid the corners, please. IAIN: Twisty roads and fast changes of direction aren't the Kluger's forte. Sunday runs should be family touring, perhaps using the 2000kg towing ability to haul a boat behind. JULES: It's a quick SUV though. The V6 has ample shove. IAIN: Great, isn't it? Smooth for cruising but put your foot down and that 218kW does a great job of accelerating two tonnes of Toyota. We returned 9.7L/100km, not too bad for a petrol V6 of its capacity. It may roll in corners, the brakes lack much feel and the steering's too light but the engine and eight-speed auto are well matched to this big car. JULES: I don't think we need the all-wheel drive though. You'd not take a Kluger over more than a dirt road so 2WD would be fine. IAIN: Agreed. Get a Prado or Fortunes if you want a Toyota that can do proper adventuring. The Kluger's home is the sealed stuff. 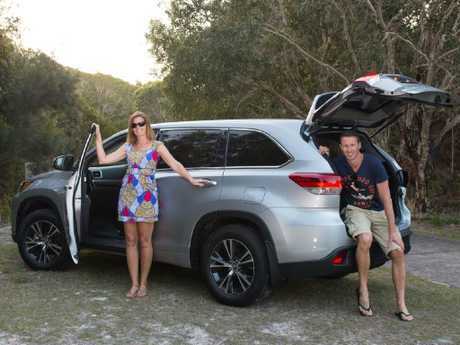 JULES: It's surprisingly easy to drive and has lots of grunt and great family space - but the Kluger is a bit vanilla. If I can get a Mazda CX-9 or Hyundai Santa Fe for the same money with more goodies, I'd say no to the Toyota. 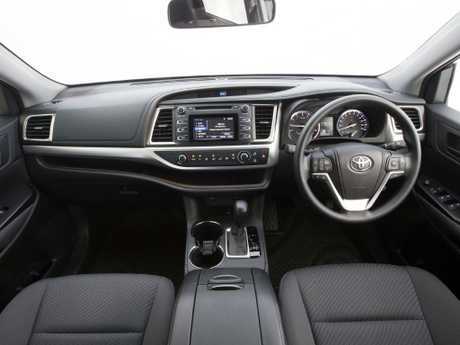 IAIN: The Kluger makes most sense as a 2WD for town use but it looks pricey next to the higher-specified rivals you mention. It's too middle-of-the-road for me. 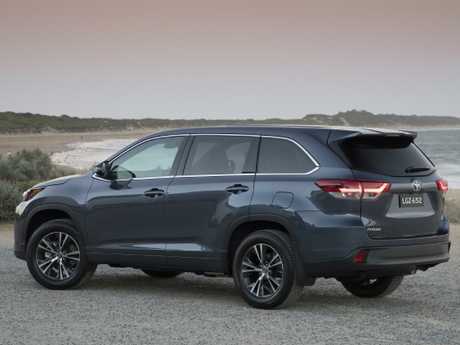 I'd get a proper 4WD Toyota SUV for family off-road odysseys but there are more appealing car-like seven-seaters that I'd choose over the Kluger.